The Dragon Lance is a limited edition Draconic type weapon. Fighting fire with fire! The Dragon Lance taps into heat from Gnawnia's magmatic underplating which passes through and focuses within the tip of the specialized anti-dragon lance! 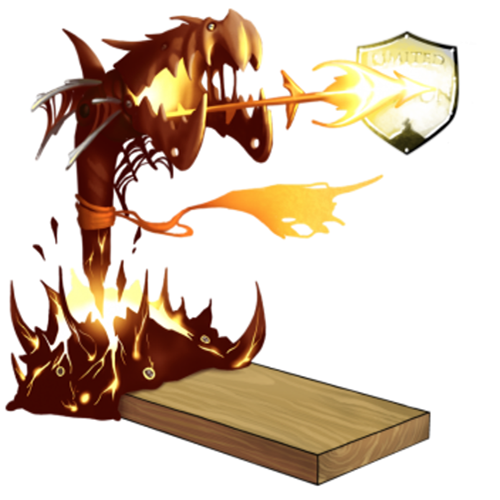 The trap is created from 100% organic dragon bones and the lance is made with dragon bone infused metal, the only material able to contain the immense power and heat generated by this trap. The Dragon Lance is a Limited Edition weapon and can no longer be acquired by Hunters. It was available to be purchased for 8,900,000 gold from Ronza's Traveling Shoppe during Ronza's May 2014 visit. It could be refunded for 1,602,000 gold at the same location. 13 May 2014: The Dragon Lance was introduced and was the second Draconic weapon introduced to the game. This page was last edited on 12 January 2019, at 12:26.